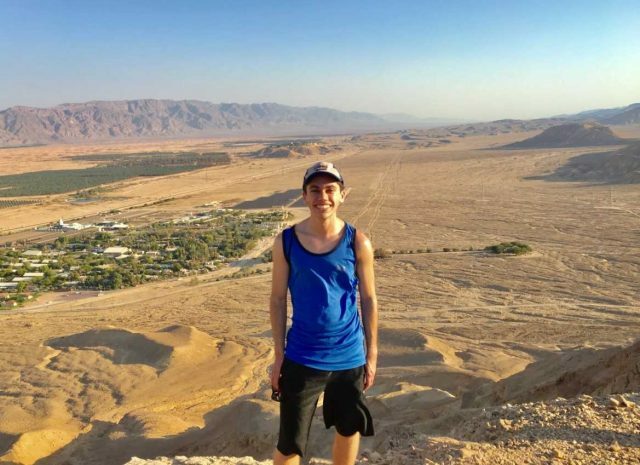 "During Fall 2018, I am studying at the Arava Institute for Environmental Studies in Israel. The Arava Institute is an environmental peacemaking program which brings together Israelis, Palestinians, Jordanians, and people across the globe to learn about environmental issues, develop an understanding of varying perspectives on the conflict, and explore pathways to peace. The Institute is located on Kibbutz Ketura, a collective community in the Arava Desert driven by the principles of socialism, Zionism, and pluralism. I am taking five environmental classes, along with a Peace-building Leadership Seminar, Environmental Leadership Seminar, and Hebrew course. In addition to the academics, the program consists of events for participants, Kibbutz activities, and excursions across Israel. I will have the opportunity for deep conversations, personal exploration, and travel. I want to thank the Duke Center for Jewish Studies, Friends of the Arava Institute, the Masa Scholarship, and my family for funding this incredible experience. Throughout the semester, I will be posting bi-weekly reflections about my experiences in the classroom, on the Kibbutz, and during my travels. I hope you enjoy hearing about my journey in Israel!"